A spike train is a series of discrete action potentials from a neuron taken as a time series, sometimes referred to as temporal coding. This string of neuronal firing may be generated spontaneously or as a response to some external stimulus. Taking a cue from nature, artificial neural networks may be implemented in computer software that reflect the basic physiology of an interconnected mesh of neurons. By presenting a sequence of input stimuli to this network, spike trains can be produced that reflect particular characteristics of the input. The message is in the pattern of interaction, not in any individual message. We create custom neural network simulations to aid our clients in recognition, forecasting and understanding. 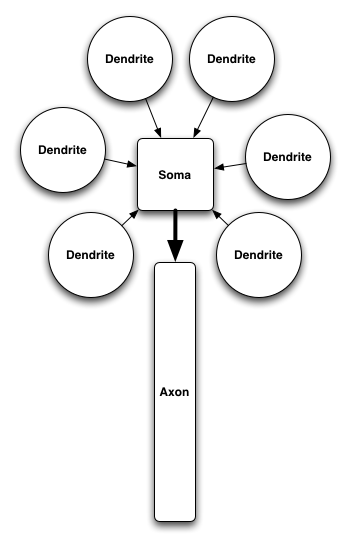 Dendrites feed potentials to the Soma. Soma collects potentials and determines whether their sum exceeds a threshold. If the threshold is exceeded, an impulse is sent down the Axon. The Axon delivers the impulse to Synapses (not shown), where Dendrites from other Neurons detect the impulse.